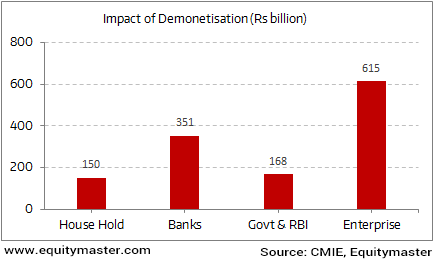 Ever since 8th November 2016, when demonetization left Rs 500 and 1000 currency notes bereft of any value, there have been speculations about its real impact on the Indian economy. Some are of the view this would destruct the discretionary demand, while others believe it to be just a deferral rather than destruction of the demand. The consensus is that it would hurt things in the short run but the long term impact would be good for the Indian economy with a control over unaccounted money, counterfeit money etc. The impact on the economy will be seen in the to come. Interestingly, there are some other factors one should look at. The transaction cost involved in replacing the currency notes is worth considering. The total outstanding value of the demonetised currency is expected to be around Rs 14.2 trillion as of 31st March 2016. Of this, Government expects Rs 4-5 trillion to be unaccounted cash. However, economists believe it to be ~Rs 2.5-5 trillion. Now, this whole exercise would involve some transaction cost. As per CMIE, the total transaction cost during 50-day window till 30th December, 2016would be ~Rs1.28 trillion. If we assume government is able to unearth Rs 4 trillion unaccounted cash, then the transaction cost would be ~26%. If the unearthed cash is Rs 3 trillion, then the transaction cost would ~43%. As per CMIE estimates, the households standing in long queues for exchanging their illegal tenders are expected to bear 12% of the total cost. This would be due to foregone wages during 50 day wages. The recalibration of ATMs, overtime salary to bank employees, extra overheads are likely to cost banks a lot. It is expected the whole 50-day exercise will cost banks Rs 351 billion. RBI & Government taking care of printing new currency, transportation of new currency lead to a hit of Rs 168 billion. The Enterprises (businesses) are already facing subdued offtakes. The whole exercise is expected to cost them Rs 615 billion or 48% of the total transaction cost. If these numbers turn out to be true, then the benefits of demonetization will lose their punch.